1) You need the Stop ID for the stop you want the live time info for. It might be printed on the actual stop OR you can get that from the Real Time Passenger Info site here. I’d recommend using a laptop or a desktop for that site as it’s easier to navigate on a bigger screen. Now, zoom in on the stop you want and click it. You should see something similar to the screenshot below. If you don’t, for whatever reason, try the next stop along the route. I’ve had to do that for my outbound journey. OK, so you should have a Stop ID to work with now so…. 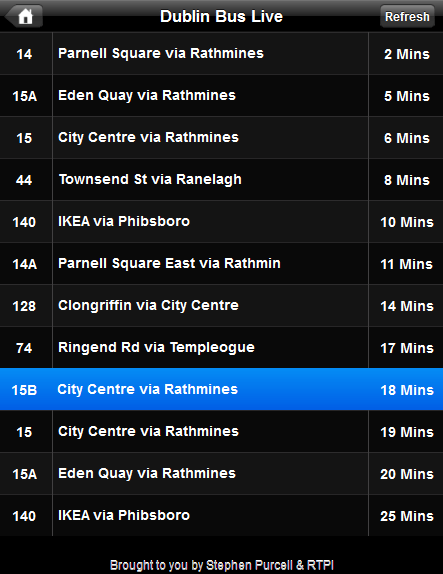 2) Go to dublinbuslive.com (on your laptop or preferably smartphone) and plug in the Stop ID and submit the form. You’ll should see something like the screen below. You can then bookmark that page and drop it onto your home screen whether Android or iPhone. I’ve been told there are apps on the way for Dublin Bus Live times but, at the moment, this is the best way to view live times on the move. 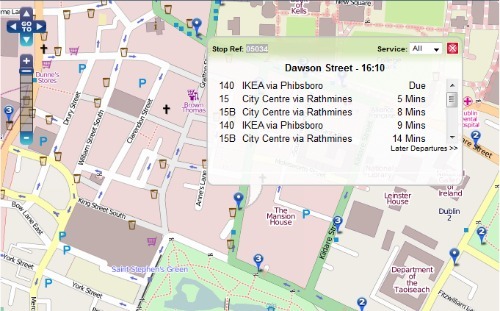 Well done to Stephen Purcell who created dublinbuslive.com.